We have just shoveled out from our first snow storm of the year and it certainly does look like Christmas. I was house bound for 2 days and finally this afternoon the roads were open, it quit snowing and we ventured out for my hair cut and groceries. I decided to start Christmas baking so today I got out “From Your House To Ours” and chose one of our favorite cookies. Our friends, Doreen and Emil often served these so the recipe was included in this cookbook. 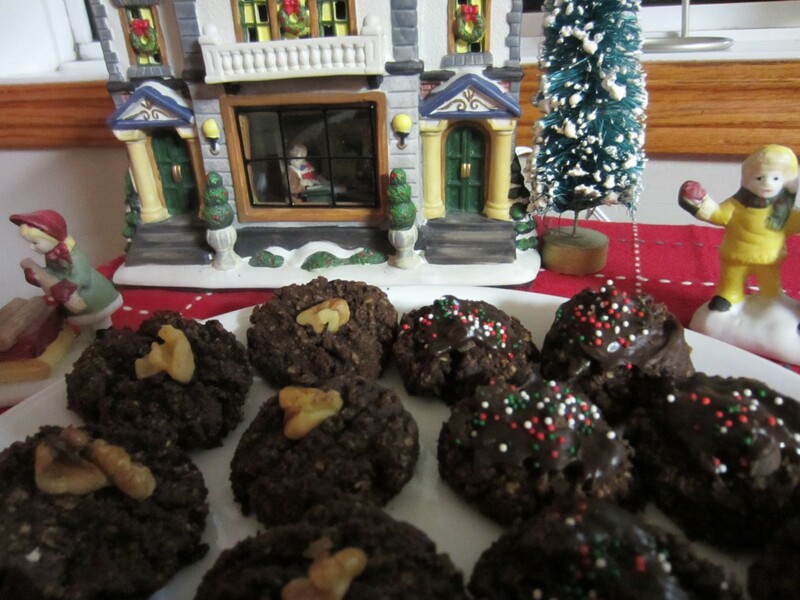 But I did what I usually do now; I made some changes to make the cookies healthier. So if you have this cookbook, and you enjoy these, I am sure you will enjoy this healthier version as well. I used less sugar, no wheat flour or margarine and added the healthy coconut flour as well as healthier fats such as avocado oil & butter. We will enjoy eating them & I will be proud to serve them to our guests. Mix all of these ingredients well in a Bosch machine, or by hand. Using a cookie scoop, place balls of dough on a ungreased cookie sheet. Press with fork. Top with a piece of walnut or other nut. Bake for 12 minutes at 350 º F.
After these were baked, I made a half batch of this recipe without any sugar. I wanted to see if it was possible so I could also have these on hand as we are trying to cut out as much sugar as possible in our diet. I am almost out of stevia so I used what I had on hand and added the honey. I mixed the dough the same as in the above recipe. I forgot to add the chocolate chips, so I melted them, spread a little on top of each and then added just a few red/white/green sprinkles. They really look festive.